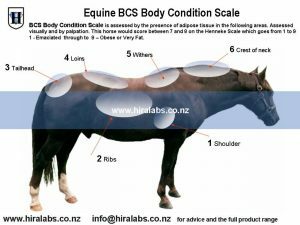 This refers to a horse that has been measured using the Body Condition Scale BCS which refers to the levels and distribution of adipose tissue on a horse and its score is between 7 and 9 with 9 being extremely fat. The Henneke Scale is based on the presence or lack of adipose tissue on the horse. This is done by a visual assessment and by palpation. 4. Moderately Thin Ridge of spine and outline of ribs are visible; tail head may or may not be visible depending on the breed; withers, shoulders, and neck do not appear overly thin. 8. Fat Apparent crease down spine; ribs difficult to feel; soft fat surrounding tail head; fat deposits along withers, behind shoulders, and on inner thighs; neck is large. 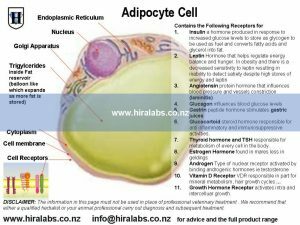 Adipocyte is a fat cell rather like an empty balloon designed to store excess energy coming in from dietary fat, protein, and carbohydrates. Spare energy is converted into lipids (fats)that enter the adipocyte to form a large single lipid droplet taking up the volume of the cell, rather like a balloon filled with oils/lipids. This droplet (the yellow centre) expands to the limit of the cell (in other words its capacity). Adipose Tissue refers to loose connective tissue formed of adipocytes. The total number and ratios of fat cells to other cells ie muscle, bone, blood etc differ from breed to breed with some horses naturally having more fat cells than others. Adipose Tissue is an endocrine organ with each of its cell membranes covered in hormone receptor sites.